So-called fast food is a blessing for rushed parents. Not only is it what the name implies but kids can’t get enough of it. The trouble is that fast food doesn’t have a very good press. And rightly so because, in spite of manufacturers’ improvements, fast food still tends to be high in fat, salt, sugar and other baddies. But what if you could make the same meal at home? If it didn’t take that much longer to prepare and was so much healthier because you’re controlling what goes into it? Burger, Chips and Tomato Salsa? Peel and crush the garlic cloves. Peel and finely dice the onion. Using your hands, mix everything, except the oil, together. Divide the mixture into 4 and shape into burgers. It’s a good idea to make the edge slightly thicker: that makes the burger less liable to break up. Put them on greaseproof paper and leave them in the fridge, covered with more greaseproof paper, for about 30 minutes before cooking. Using a little oil and a non-stick pan, if you have one, fry the burgers until cooked, remembering to turn them once. Alternatively you can brush them with oil and grill them. Serve in buns with salad and salsa, and with oven-baked wedges (see below). 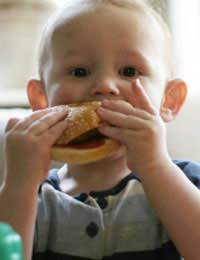 Chicken and turkey are much loved by dieticians for their low fat qualities, and lots of kids prefer white meat burgers. Mix everything together and shape into 4 burgers. Brush lightly with oil and grill until cooked.Serve with tomato salsa and oven-baked wedges (see below). Scrub the potatoes and cut each potato into 8-10 wedges. Pat them dry with kitchen towel. Place the chilli/curry powder in a plastic food bag with the oil and shake it up a bit, then add the potato wedges and give them a good shake, rubbing if necessary to make sure they’re all coated. Spread the wedges out onto a baking tray and cook for 25-30 minutes. Halve the tomatoes and scoop out the seeds. Dice the flesh. Peel and finely dice the onion. If you’re using a chilli, remove the stalk and seeds and chop very finely. Wash you hands thoroughly afterwards and avoid touching your eyes. Chop the coriander or basil. Mix everything together, seasoning and adding the sugar, which draws out the flavour of the tomatoes. Leave to stand for 30 minutes. There are many variations on this recipe. Some include garlic and green peppers; others, especially in the winter, use tinned tomatoes and simmer the sauce for a short or long time, depending on the desired consistency! See which is your favourite!